This article is about Henry "Light-Horse Harry" Lee, the American Revolutionary War officer. For many other individuals with similar names, Harry Lee or Henry Lee. Major-General Henry "Light-Horse Harry" Lee III (January 29, 1756 – March 25, 1818) was an early American Patriot and politician. He served as the ninth Governor of Virginia and as the Virginia Representative to the United States Congress. Lee's service during the American Revolution as a cavalry officer in the Continental Army earned him the nickname by which he is best known, "Light-Horse Harry". [note 1] He was the father of Robert E. Lee, commander of the Confederate armies in the American Civil War. Lee was born near Dumfries in the Colony of Virginia. He was the son of Col. Henry Lee II (1730–1787) of "Leesylvania" and Lucy Grymes (1734–1792). His father was the first cousin of Richard Henry Lee, twelfth President of the Continental Congress. His mother was an aunt of the wife of Virginia Governor Thomas Nelson, Jr. His great-grandmother Mary Bland was also a grand-aunt of President Thomas Jefferson. Lee was the grandson of Capt. Henry Lee I, a great-grandson of Richard Bland, and a great-great-grandson of William Randolph. He was also a descendant of Theodorick Bland of Westover and Governor Richard Bennett. Lee graduated from the College of New Jersey (now Princeton University) in 1773, and began pursuing a legal career. With the outbreak of the Revolutionary War, he instead became a captain in a Virginia dragoon detachment, which was attached to the 1st Continental Light Dragoons. In 1778, Lee was promoted to major and given the command of a mixed corps of cavalry and infantry known as Lee's Legion, with which he won a great reputation as a capable leader of light troops. At the time, highly mobile groups of light cavalry provided valuable service not only during major battles, but also by conducting reconnaissance and surveillance, engaging the enemy during troop movements, disrupting delivery of supplies, doing raiding and skirmishing, and organizing expedition behind enemy lines; part of such tactics now are known as guerrilla warfare and maneuver warfare. In September of the same year, Lee commanded a unit of dragoons which defeated a Hessian regiment at the Battle of Edgar's Lane. It was during his time as commander of the Legion that Lee earned the sobriquet of "Light-Horse Harry" for his horsemanship. On September 22, 1779 the Continental Congress voted to present Lee with a gold medal—a reward given to no other officer below a general's rank—for the Legion's actions during the Battle of Paulus Hook in New Jersey, on August 19 of that year. Lee was promoted to Lieutenant Colonel and was assigned with his Legion to the southern theater of war. Lee's Legion raided the British outpost of Georgetown, South Carolina with General Francis Marion in January 1781 and helped screen the American army in their Race to the Dan River the following month. Lee united with General Francis Marion and General Andrew Pickens in the spring of 1781 to capture numerous British outposts in South Carolina and Georgia including Fort Watson, Fort Motte, Fort Granby, Fort Galphin, Fort Grierson, and Fort Cornwallis, Augusta, Georgia. They conducted a campaign of terror and intimidation against Loyalists in the region, highlighted in Pyle's Massacre. Lee and his legion also served at the Battle of Guilford Court House, the Siege of Ninety-Six, and the Battle of Eutaw Springs. He was present at Charles Cornwallis's surrender at Yorktown, but left the Army shortly after, claiming fatigue and disappointment with his treatment from fellow officers. In 1794, Lee was summoned by President George Washington to suppress the Whiskey Rebellion in western Pennsylvania. Lee commanded the 12,950 militiamen sent to quash the rebels; because of a peaceful surrender, there was no fighting. In 1798, in anticipation of a war with France, Henry Lee was appointed a major general in the U.S. Army. In 1808, he was recommissioned by President Thomas Jefferson as major-general when war with Great Britain was imminent; Lee organized the Virginia militia. He asked President James Madison for a commission at the onset of the War of 1812 but without success. In 1812 he published his Memoirs of the War in the Southern Department of the United States, where he summarized his military experiences during the Revolutionary War. From 1786 to 1788, Lee was a delegate to the Congress of the Confederation, and in 1788 at the Virginia convention; he favored the adoption of the United States Constitution. From 1789 to 1791, he served in the General Assembly and, from 1791 to 1794, was Governor of Virginia; a new county of Virginia was named after him during his governorship. From 1799 to 1801, he served in the United States House of Representatives of the Congress. He famously eulogized Washington to a crowd of 4,000 at the first President's funeral on December 26, 1799 as "first in war, first in peace, and first in the hearts of his countrymen". Henry Lee IV (May 28, 1787 – January 30, 1837), was a historian and author who also served as a speech writer for both John C. Calhoun and presidential candidate Andrew Jackson, also helping the latter to write his inaugural address. Robert Edward Lee (January 19, 1807 – October 12, 1870), the fifth child of Henry and Anne, served as Confederate general-in-chief during the American Civil War. During the civil unrest in Baltimore, Maryland in 1812, Lee received grave injuries while helping to resist an attack on his friend, Alexander Contee Hanson, editor of the Baltimore newspaper, The Federal Republican on July 27, 1812. Hanson was attacked by a Democratic-Republican mob because his paper opposed the War of 1812. Lee and Hanson and two dozen other Federalists had taken refuge in the offices of the paper. The group surrendered to Baltimore city officials the next day and were jailed. Laborer George Woolslager led a mob that forced its way into the jail, removed the Federalists, beating and torturing them over the next three hours. All were severely injured, and one Federalist, James Lingan, died. Lee suffered extensive internal injuries as well as head and face wounds, and even his speech was affected. His observed symptoms were consistent with what is now called post-traumatic stress disorder. After unsuccessful convalescence at home, he sailed to the West Indies in an effort to recuperate from his injuries. On his way back to Virginia, he died on March 25, 1818, at Dungeness, on Cumberland Island, Georgia, cared for by Nathanael Greene's daughter Louisa. "Light-Horse Harry" was buried with full military honors, provided by an American fleet stationed near St. Marys, Georgia, in a small cemetery at Dungeness. In 1913, his remains were moved to the Lee family crypt at Lee Chapel, on the campus of Washington & Lee University in Lexington, Virginia. The fictional character of Colonel Harry Burwell in the film The Patriot according to screenwriter Robert Rodat was inspired by the historical exploits of Henry Lee. In the musical 1776 Lee's nickname is mentioned (anachronistically) during the song "The Lees of Old Virginia," sung by the character of his older cousin Richard Henry Lee. ^ In the military parlance of the time, the term "Light-horse" had a hyphen between the two words "light" and "horse". See the title page of The Discipline of the Light-Horse. By Captain Hinde, of the Royal Regiment of Foresters, (Light-Dragoons.) published in London in 1778, a cavalry tactics classic which was used as a manual. ^ The medal (which is actually silver) finally presented to Lee is in Princeton University’s Numismatic Collection. 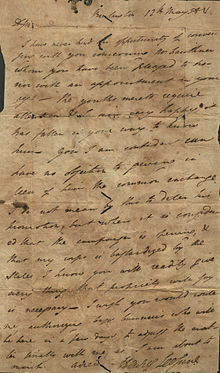 Also included are a signed letter of Lee's to the New Jersey quartermaster from 1780 and a signed letter of the same year from George Washington to Lee approving Lee’s plan to capture Benedict Arnold. ^ "Papers of George Washington". Gwpapers.virginia.edu. Archived from the original on February 28, 2012. ^ Fontaine, William W. The Descent Of General Robert Edward Lee From Robert The Bruce, Of Scotland, Civilwarhome.com. Retrieved October 13, 2008. Hogeland, William (2006). The Whiskey Rebellion: George Washington, Alexander Hamilton, and the Frontier Rebels Who Challenged America's Newfound Sovereignty. New York: Scribner. ISBN 978-1-4391-9329-7. Herrera, Ricardo A. "(T)he zealous activity of Capt. Lee': Light-Horse Harry Lee and Petite Guerre," Journal of Military History, 79 (Jan. 2015), 9–36. Royster, Charles. Light-horse Harry Lee and the Legacy of the American Revolutionary War. Williamsburg, Va.: Institute of Early American History and Culture, 1978. Chisholm, Hugh, ed. (1911). "Lee, Henry" . Encyclopædia Britannica (11th ed.). Cambridge University Press. Wikimedia Commons has media related to Henry Lee III. United States Congress. "Henry Lee III (id: L000195)". Biographical Directory of the United States Congress.